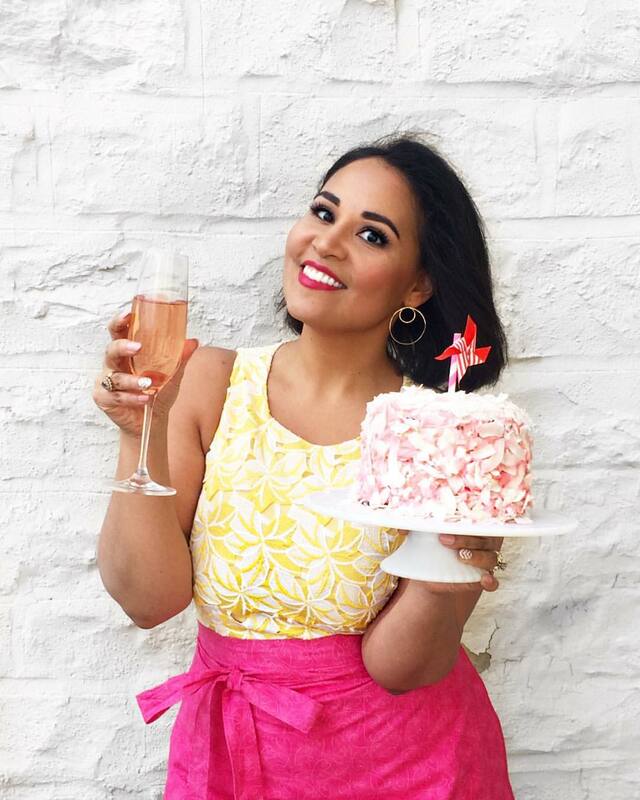 My birthday this year fell on a Thursday, which gave me the perfect excuse to arrange for bookend celebrations the weekend before and after. Last Sunday, wrapped in my vintage mink collar, I joined my parents and Eugene's for an early birthday dinner at Ilili, an opulent Lebanese restaurant in Murray Hill recommended to me by the fabulous Erika of The Pastry Chef at Home. Due to an Eastern European superstition observed strictly by Eugene's mother, we were careful to avoid any mention of the phrase "Happy Birthday," and instead focused on the parade of impeccable dishes that appeared on our table in a seemingly unending succession. Since there were six of us, we each chose two mezze to share, plus an extra order of my personal favorite: fried kibbeh, those crisp little footballs of bulghur and seasoned lamb that I've craved like clockwork every few months since they were first introduced to me by an otherwise unmemorable date some six or seven years ago. We passed the many dishes around the large round table with abandon, helping ourselves and then reaching out again for second and third bites between satisfied moans. The kibbeh were perfect, of course, but I also loved the spicy braised sausage, the crisp sheets of pastry topped with ground lamb and what I suspect were hints of cinnamon and allspice, and the fresh tabbouleh salad that I unashamedly helped myself to from Eugene's father's plate. There were marrow bones, too, and crisp nuggets of liver, but I couldn't really eat more than a tiny bite of each. Say what you will, but I freely admit that I don't have much of a tolerance for offal. My father is like me on this, but the rest of the party enjoyed them, while I happily focused on dipping freshly baked puffs of pita into a broth-rich bowl of Araq-steamed clams. My main was a lamb burger so flavorful it nearly knocked my previous favorite burger--the pair of explosive pork and beef sliders at Fatty Crab--from its long-cemented top spot. Instead of wine, we ordered from the inventive cocktail menu. I fell in love with a sparkling passion fruit and cilantro-mint vodka concoction; Eugene stuck with St. Germaine, gin, and muddled-basil. The passion fruit cocktail, by the way, smelled just as good as it tasted. So good that I actually spent the first three minutes just sniffing it. Dessert, which unbeknown to you has actually been my point all along (but really, isn't it usually? ), was a bit of a complicated affair. See, the thing is that I arrived at the restaurant with a plan. I'd spent quite a bit of time researching the menu and had discovered that in the dessert section, they offered either a trio of sorbets or a trio of ice creams. The problem was that I wanted a combination of sorbet AND ice cream. Specifically, I wanted to try the much-lauded "milk" ice cream, a fragrant combination of rose water and orange blossom; the apricot ice cream, and the passion fruit sorbet (of course). I'd been planning to use my birthday as leverage to have the waiter agree to combining the two for me. The only problem was that I forgot that it was Restaurant Week! And during Restaurant Week, they require that either everyone or no one order from the special menu. Personally, I hate Restaurant Week menus. I find them limiting and annoying, and I'd much rather spend a little more to get what I actually want than sticking to a reduced-price menu with restricted offerings. Ilili, to its credit, had a rather expansive Restaurant Week selection on offer (take note, OTHER places), but I still had to go off-menu to order the Kibbeh, and the dessert option unfortunately limited us to just ONE flavor of ice cream with no (gasp!) passion fruit sorbet option. Fortunately, I worked it out. I explained to the waiter exactly what it was that I wanted--even revealing to him my aforementioned plan and the fact that it was my birthday, and he worked with me. He told me to order a regular dessert from the Restaurant Week menu, and told me that he would try to get the manager to buy me the special ice cream-sorbet concoction I wanted. In the end, it worked out even better than I imagined since I ended up with not just one dessert, but four. I got the "candy bar," a clever little brownie-caramel-cookie bar, my Lebanese apricot and milk ice creams, a bowl of fragrant honey-drenched dumplings, and my coveted passion fruit sorbet with a candle on top. Now that, dear readers, is how we do birthdays here at Always Order Dessert. Everything was incredible, but what captured my imagination most was the fragrant milk ice cream. 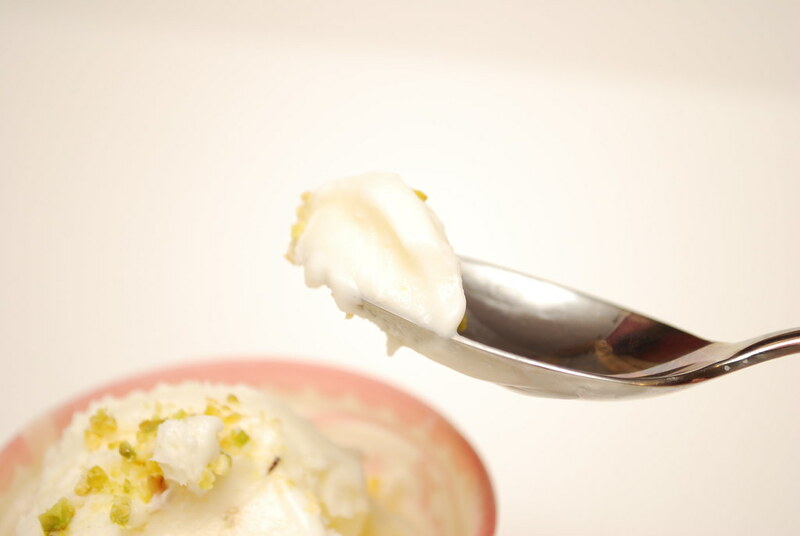 Arabic ice cream (or bouzat haleeb) is a much different affair than the rich custardy treats popular here in the US. 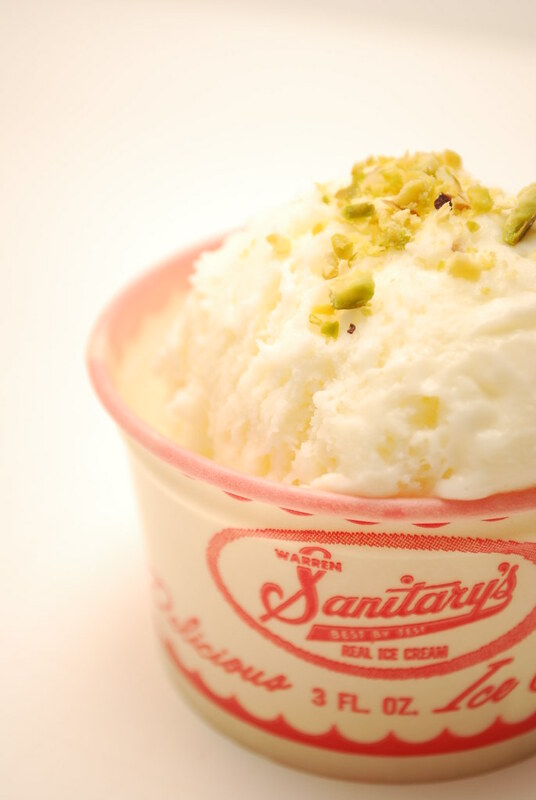 Simultaneously light and creamy, the ice cream has a bit of an elastic quality because it's thickened with sahlab, an orchid tuber extract typical throughout the Middle East. Flavored with rose and orange blossom, the ice cream is floral without tasting soapy, and after that tiny scoop on Sunday night, I was determined to recreate the experience at home. True sahleb is nearly impossible to find in the US. It only seems available in a sugary powdered drink form, and I read somewhere that it's actually illegal to export from Lebanon. Fortunately, readily available cornstarch is a decent substitute and though you won't get quite the same elastic quality, the rich mouth-feel will be very close. Mastic is much easier to fine (online, at least) but it's an optional ingredient. What you do need is a bottle each of rose water and orange blossom (or orange flower) water. These are easily obtained in the Middle Eastern/Asian aisles of most well-stocked supermarkets or from Middle Eastern specialty grocers. Latin grocers should also carry them since Latin grandmothers tend to love to splash that water around babies and doorways to ward off evil spirits and such (ask for "Agua de Azahar" for orange blossom and "Agua de Rosa" for rose water). The bottles are rarely more than 1-3 dollars each and they last a long time since you never want to use more than a couple tablespoons in a recipe unless you're hoping to end up with a bowl full of cologne. We ate at the restaurant on Sunday. I made this ice cream on Monday. And, I confess, I've been eating a scoop of it every single night since. The ice cream freezes beautifully and scoops easily. While you're shopping for ingredients, grab a bag of pistachios too. A few crushed and sprinkled on top will complete the dish. Serve it alone or with chocolate cake or as the dessert course in a middle eastern themed dinner party. Any and every way, it's a showstopper. This floral ice cream is flavored with rose and orange blossom waters, and has a creamy mouth feel unlike anything I've ever tasted. Thickened with cornstarch instead of eggs, it's a practically "foolproof" ice cream that freezes and serves beautifully. 1. Whisk together the cornstarch and cold heavy cream in a bowl until it's smooth and well-combined with no lumps. Set aside. 2. Combined the milk and sugar in a saucepan over medium heat, stirring occasionally until the sugar is full dissolved (about 2 minutes). Remove from the heat and gently pour in the heavy cream and cornstarch mixture, stirring to combine. Return the pan to the stove over medium heat and let cook, stirring constantly in one direction until the mixture thickens. Continue to let cook for an additional few minutes, tasting it occasionally until you can no longer detect the taste of cornstarch. Once the cornstarch is completely cooked and the mixture is thick enough to coat the back of a spoon, turn off the heat. 3. Add the tablespoon and a half of rose water and the tablespoon and a half of orange blossom water and stir in until well combined. Pour the mixture into a large bowl and press a piece of plastic wrap against the surface (this will help prevent a skin from forming on it while it cools). Chill in your refrigerator for 3-4 hours until completely cool (you can make this up to 24 hours in advance). 4. 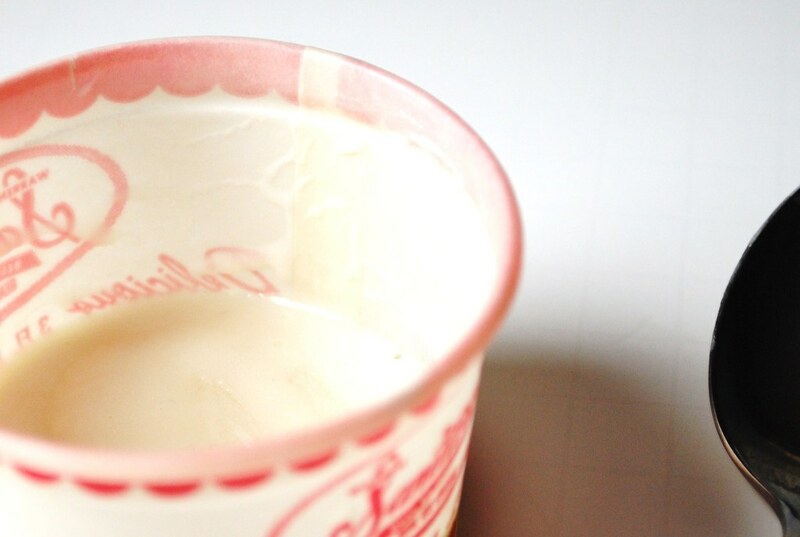 When ready to freeze, pour the mixture into your ice cream maker and process according to manufacturer's instructions. Once the ice cream has frozen to the consistency of soft-serve, pour into an air-tight and freezer proof container and freeze for at least 4 hours (again, overnight is also OK) before serving. If desired, serve topped with a sprinkle of crushed pistachio. The ice cream will keep in a sealed container in your freezer for up to 2 weeks. What an excellent birthday dinner! Happy Birthday!!! The freshly baked puffs in the clammy broth sound divine....so does everything else! Murray Hill, used to live there about a decade ago. Don't recall this place. The Lebanese Milk ice cream sounds delish! Oh, that sounds fantastic! Happy birthday! Oh my word... You had my heart at kibbeh. My father is Palestinian and I grew up around amazing cooks. Kibbeh is solidly fried crack and ANY time I see it on a menu, I have to order it. I'm surprised I've never heard of Ilili, I will have to go very, very soon. The lamb burger also sounds amazing, and so does the milk ice cream. Rose water and orange blossom water can be delightful flavors with used lightly and appropriately. Thank you for the heads up on a new place to check out and for making my mouth water. 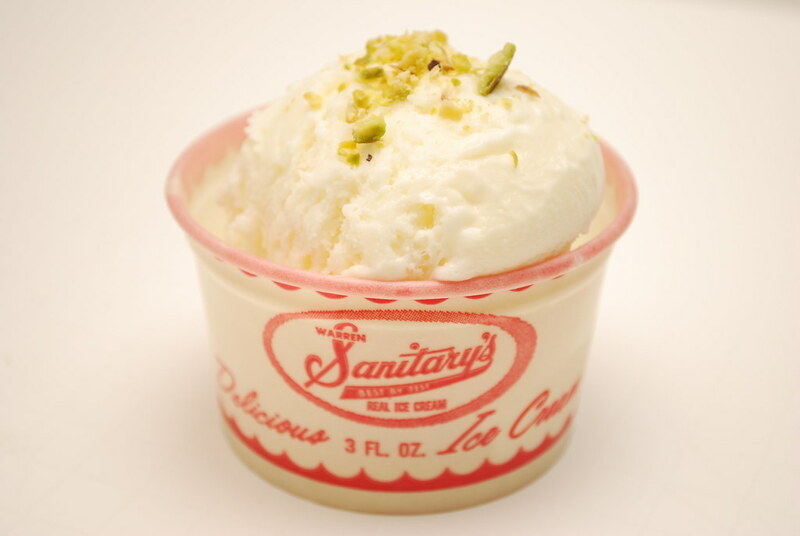 The pistachio-topped ice cream looks great! What a nice birthday dinner. Happy Birthday! This sounds great! I love it! Thanks also for sharing this one to us. Fried kibbeh? I've never heard of it but from the description yum! And I had no idea there was such a textural difference with Middle Eastern ice creams. Both of these sound so fantastic i'm going to set out to find them this week. I'm sure in LA I will succeed! Great suggestion! I'm heading to NYC for a quick weekend in April and I think I may have to stop here for a sweet. As always, you're on your game! Almost anything Lebanese that I have come across has been delicious, so I am eager to try this out with the ice cream maker I got for my birthday! But I think it will have to wait for some warmer weather.